Display flags (light blue) are found on TOPs, CHOPs, and SOPs and Object components. Turning on an operator's Display flag will allow the OP's data to be viewed in a Viewer pane (ie TOP Viewer, SOP Viewer, CHOP Viewer, or Geometry Viewer respectively). If a Network Editor pane has the backdrop display option enabled, then the OPs of that type with their display flags on will be shown in the backdrop of the editing pane. The network will 'float' on top. 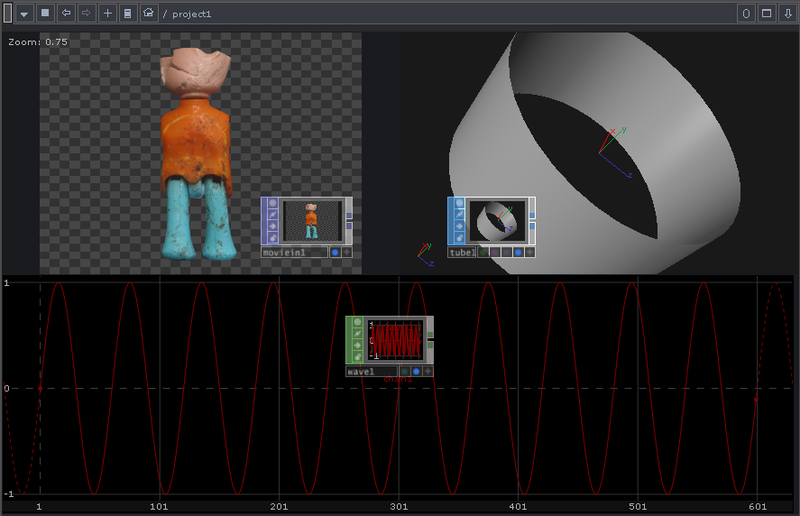 Backdrop display is enabled using the network editor's right-click menu, Display > Backdrop TOPs (or Backdrop CHOPs/Backdrop Geometry). The same Display flag on 3D components is used to select objects to view in a Camera component, and in the parent's viewer.